As an avid reader, I search out books that will broaden my thinking, open my heart, teach new ideas, and provide inspiration. I have put together my list of the best books I have read in 2009 (many of which were not published in 2009). Rather than give a synopsis of each book, I am including the book title, author, and a quote that moved me or inspired me. Hope you enjoy. Please feel free to recommend books you think I ought to add to my 2010 list. Just when you think you have experienced everything on the NYC subway system, you wake up and realize that new experiences are there waiting for you. Last week, I took the G train to Brooklyn and realized in my almost 20 years in NYC, I had never taken the G train before. I felt like a little kid taking a ride and felt excitement come over me as I discovered new parts of the city. I wasn‚Äôt always open to new subway moments. As a matter of fact, I have had my share (like most New Yorkers) of MTA frustrations, announcements, delays, and cancelled services. Throughout my years taking the MTA subway into Manhattan from the Bronx, I have been delayed by hours due to sick passengers, kicked off the train for unknown reasons, asked to exit through all the cars because of a fire, and left stranded at East 180th Street. 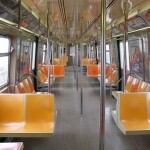 For many years, I had subway anxiety. I worried about getting to work late and panicked when the train was delayed for ‚Äútraffic ahead.‚Äù Having to stand for an hour on the subway also caused a lot of distress. I decided to travel with a good book and iPod to help get me through my ride with more ease. I would tune out the announcements and concentrate on reading and listening to my favorite music or podcasts. This past week, I had an amazing MTA mystical moment. I was listening to the Oprah-Spirit Channel Podcast ‚Äì that alone is a mystical moment. I had downloaded a few podcasts that expand my thinking and spark my creativity. On this particular morning, I was listening to an interview with Oprah and Daniel Pink (his book A Whole New Mind is amazing). In the background, the conductor was making announcements about delays. At first I ignored them, but then our train stopped for at least 5 minutes, and the announcement came again, ‚ÄúWe are sorry for the delay. There is a police investigation up ahead. As soon as we receive clearance, we will proceed.‚Äù Passengers started mumbling, cursing, and rolling their eyes at the announcement. I let the questions float without answering them. I began to see a screen of areas in my life that need further exploration. I started my morning by experiencing the delay as an opportunity to investigate parts of my work, relationships, and dreams. The delay taught me the lesson of slowing down and not rushing from thing to thing. Am I in a rush or is my mind in a rush? Looking for the bigger picture in the smaller moments can be some of the greatest gifts ‚Äì even with a half hour delay due to a police investigation. I am grateful to the MTA for giving me the mystical moment to slow down and investigate my life. What a beautiful way to start the day! Perfect!